Part 2 is the multiple choice admission test utilized by both Kealing Magnet and Fulmore Magnet, called the Ravens Test, which is a 40 minute non-verbal assessment measuring abstract, spatial, and logical reasoning. Each Raven test has the same format: a 3 x 3 matrix in which the bottom right entry is missing, and must be selected from 8 alternatives. Solving Raven’s matrices type problems essentially requires figuring out the underlying rules that explain the progression of shapes. The variations of the entries in the rows and columns of this problem can be explained by 3 rules. 1. 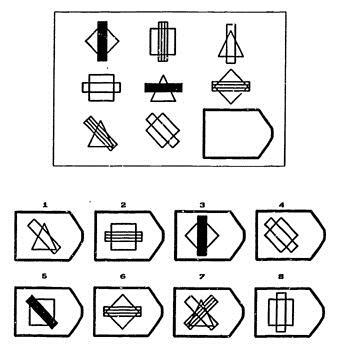 Each row contains 3 shapes (triangle, square, diamond). 2. Each row has 3 bars (black, striped, clear). 3. The orientation of each bar is the same within a row, but varies from row to row (vertical, horizontal, diagonal). From these 3 rules, the answer can be inferred (5) is the correct answer.